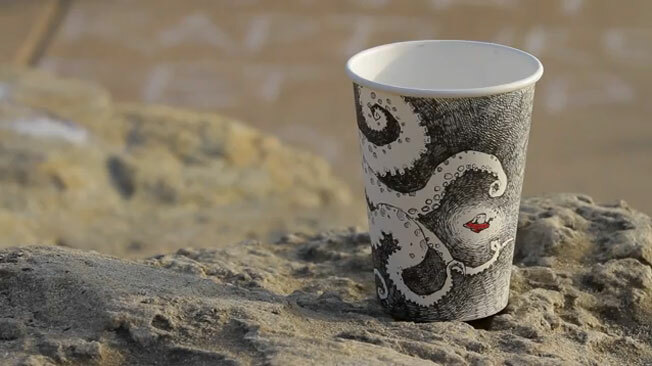 That's the message of this poignant video from Sharpie starring Cheeming Boey, a young California-based illustrator who grew up on a Malaysian bird farm and has found minor fame in the U.S. art world for his Sharpie illustrations on styrofoam cups. The spot—part of a sweeping back-to-school ad campaign from Draftfcb in Chicago—is one of four videos starring quirky Sharpie users, who use the implements as tools of self-expression. The other three are Erica Domesek, who uses a Sharpie fabric marker to turn a pencil case into a purse; Mark Rivard, who creates custom skateboard designs with Sharpies; and Marirose Weldon, a singer-songwriter who writes her lyrics in Sharpie Liquid Pencil. But Boey's story is the most touching, as the kid who was terrible at math makes good with his version of doodles on a napkin. The theme is the pleasantly straightforward "It starts with Sharpie," and it's the next evolution of a campaign running under the somewhat more contrived line "Uncap what's inside." It includes new packaging and a newly redesigned website at Sharpie.com, which nicely showcases the work of Boey and others in the "Sharpie Squad." The site also encourages fans to send in their own Sharpie-produced artwork for a chance to be featured on the YouTube homepage when Sharpie takes it over for the entire day on Aug. 27. Hopefully Boey won't enter, so others will have a chance. Campaign: "It Starts With Sharpie"